Each class has a 1 hour computing session each week. This lesson may be in the classroom, the computer suite or using the iPads. We use a programme called 'iCompute' which is designed according to the national curriculum objectives so that each class is covering the necessary components. Throughout the year, each year group benefits from computing sessions with our specialist teacher, Mr Triggs from MGL. The Year 3 & 4 children are also welcome to attend a Minecraft club after school on Tuesdays with Mr Triggs. Computing is also taught using a cross-curricular approach during other subject lessons. In order to deliver high quality ICT provision, we have invested in a completely new computer suite and server this year, complimented by a bank of laptops, iPads and classroom PCs. 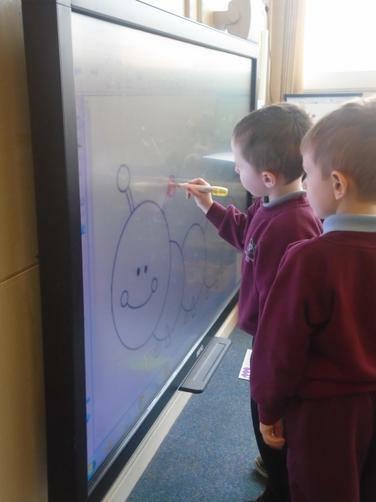 Children in Nursery regularly use a large interactive screen to explore their creative side and practice letter formation and gross motor skills. iPads are a vital part of the learning experience in Early Years, with children proficient in the use of many educational apps. This year we have enlisted the support of MGL to help us to deliver our ICT curriculum. Y5 and Y6 have taken part in Coding lessons, learning how to form complex algorithms to create great projects and games. Y3 and Y4 will also have the opportunity to attend an after school Minecraft club, using the popular game to explore and create both real and imaginary worlds.